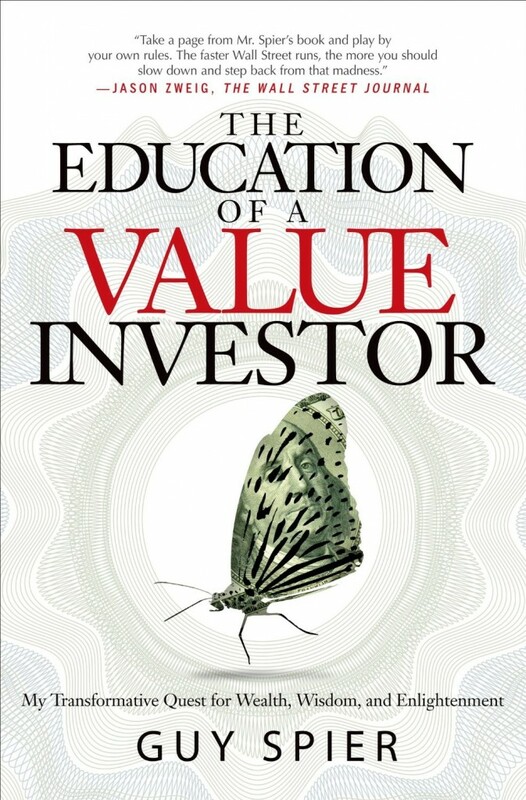 In the near future, I will be writing a a review of Guy Spier’s The Education of a Value Investor, which will be released next week. Until then, to whet your appetite, here is an 11 question Q&A that I did with Guy, for which I give him thanks, because his time is valuable. I think that many have surprised me in one direction or another, but one of the more memorable was Duff and Phelps Credit rating – which I purchased in the mid-1990’s at a 7 Price to Earnings ratio. The company proceeded to increase in value by seven times over 2-3 years before being purchased by Fimalac, the owner of Fitch. I had expected the stock to double, but I did not understand that I had purchased a super high quality business with a manager who was committed to devoting every cent of free cash, which was in excess of reported earnings, to repurchasing shares. Which rule(s) of your checklist would surprise average investors the most, if any? I actually think that none of them would. They are common sense items that anyone would look over and say, “yes – that makes obvious sense”. What is key is not that they are surprising, but that in the wrong state of mind, I might easily skip over a particular factor in evaluating an investment. Would you advise young people to get a CFA charter or an MBA or is there a better way to become an investor? I don’t think that either is necessary in order to become a good investor. Attending the Berkshire Hathaway meetings, studying Warren Buffett and reading the Berkshire Annual Reports, along with Poor Charlie’s Almanack are an absolute necessity, in my view. Yes. It’s a no brainer to do it if you have the skills. I hope that I have the skills, but I don’t think that the time has been ripe for me. Mohnish Pabrai has recently launched Dhandho Holdings which I think will be an extraordinarily successful enterprise over the years. It’s one to watch. What would you say is the most common mistake that value investors make? Does this matter if the value investor is amateur or professional? Amateur investors who are investing unlevered funds that they don’t need any time soon have no such pressures. Financial companies are usually a big part of the portfolio value investors, because they seem cheap to industrials and utilities. But every now and then financials wipe out in a credit crisis. Why don’t many value investors pay attention to credit conditions? Yes, that’s absolutely true. Many value investors love the financial industry: Probably because, in a certain way, we are in it ourselves. And yes, value investors probably pay far too little attention to the credit cycle. In my case, I think that I was utterly convinced that my stocks were sufficiently cheap, such that I could invest without regard to financial cycles. But I learned my lesson big time in 2008 when I was down a lot. I now subscribe to Grant’s Interest Rate Observer so that to help me track the credit cycle. Are your wife and children happier as a result of the changes to your life since becoming a value investor in the style of Warren Buffett? Absolutely. I spend more time with them. I am simply around more, although that can come with its own irritations. You might have to ask them. I appreciate your “investing tools,” and I do things mostly like that, but isn’t the main goal of them to be reasoned, dispassionate, independent-minded, etc.? The actual form of the rules is less important than the effect it has on our personalities in making decisions rationally, yes? Yes – I 100% agree and thus a different personality might have a very different set of rules to guide them. That’s why the book is about my education as a value investor. It’s personal and idiosyncratic. I would fully expect someone else to come up with different rules of behavior. I do hope though that it will allow people to see that getting to a reasoned, dispassionate, independent minded state is a struggle for this investor, at least and that thinking about our meta environment and making good decisions about that is just as, if not more important than the actual investment decisions. How do you balance keeping an independent view versus interacting with respected professional friends who have their views? I try to switch off, or distance myself from people who I think communicate in a way that is not productive for me. The key is to have the kind of discourse that allows other people to come to their own conclusion. Asking open ended questions and not telling someone what to do are important aspects of that. When I come across people who do that, I try to build closer relationships with them. If they don’t I might still keep them in my circle, but I would not allow myself to interact with them too often – because I don’t want to be swayed. How do you feel about those who use 13F filings to generate ideas? Mohnish Pabrai taught me to be a cloner. In the academic world, plagiarism is a sin. In business, copying other people’s best ideas is a virtue, and it is no different in investing. I would go further. In the same way that if I wanted to improve my chess, I would study the moves of the grandmasters, if I want to improve my investing, I need to study the moves of the great investors. 13F’s are a great way to do that. How do you feel about quantitative value investors? I am not sure that I understand the way that you are using the term. If you mean to use statistical methods to uncover value, Ben Graham style, then I’m all for it. That is what I did when I created my Japan basket. That said, I found it hard and monotonous work. Monotonous because, in the case of Japan it did not lead to greater knowledge or wisdom about the world, because there was a limit on the degree to which I could drill down. But that said, I do run screens for value on S&P CapitalIQ from time to time, and then drill down on some of what comes up. Again, thanks to Guy Spier for taking time to answer some questions for us… his book is being released on September 9th. Look for it.